The River Company is excited to announce the introduction of our educational youth trips for the 2008 summer rafting season. These trips are not only fun and exciting, but educational at the same time. We feel that learning through hands-on experience is an essential part of this whitewater rafting trip. Understanding their surroundings will help kids build a strong relationship with this area by fostering an awareness and appreciation of this unique ecosystem. History of Stanley Basin: Native Americans, Trappers and Miners, Oh My! Geography: Where in the World Are We and Where Does This Water Go? Animal Tracking: Who Lurks In These Parts? For the 2008 season our educational trips are available as custom trips only to groups of 12 or more. Please call or email us for more information. 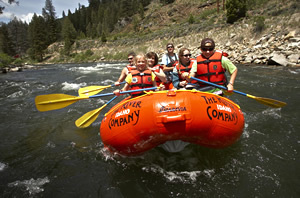 This entry was posted on Thursday, March 20th, 2008 at 10:52 am	and is filed under Guides, Idaho, The River Company. You can follow any responses to this entry through the RSS feed.